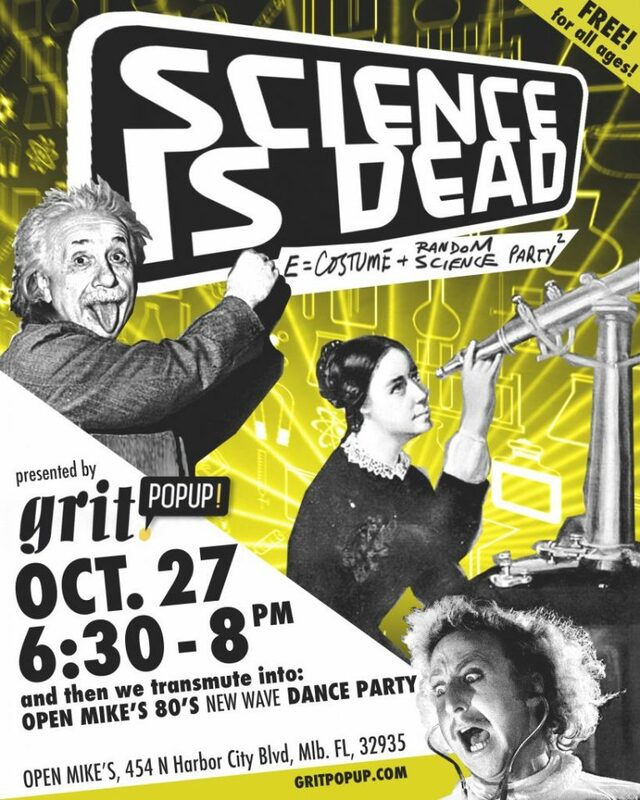 SCIENCE IS DEAD CELEBRATION is an excuse for Space Coast nerds will glue, stitch, weld, or program their finest costume to showcase Oct 27, 6:30PM at an undisclosed location for a great cause. ‘A TOAST TO BRAINS’ will be hosted by Dr. Christine Salinas of Space Coast Neuropsychology Center to start the evening. This is a mental health community discussion that aims to show how residents can support Ninos Health (501c3) in increasing access to expert mental health and brain care. Afterward, resident Greg Hyland will launch a Big Ideas for Brains pitch competition, which will run now to 2019 and award one local team $5,000 to develop a software application for mental health screenings. Michael Jackson THRILLER Flash Mob!!! Following these announcements, participate in a Michael Jackson Thriller Flash Mob. Dead and living slam poets are then invited to perform on-stage while an atmospheric concert is performed by Alchemy Twins and Stewart Coleman. WARNING: The more neurons & wit spent on your costume, the more tickets you’ll get to enter the GRIT Raffle. Two creative creatures will be selected as “SCIENCE IS DEAD” award losers by 8PM. *100% of doorman donations go to the Ninos Health nonprofit. Ninos Health will offer FREE mental health screenings and resources on site following the presentation. Register below to discover location the day of via text or Facebook.